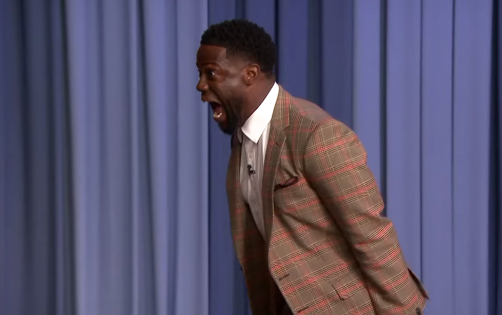 Unless you’ve been living under a rock, you will have seen the video from The Tonight Show with Jimmy Fallon starring Kevin Hart and Robert Irwin circulating online. The episode of the chat show, broadcast live from the Rockefeller Centre, brought together two things that work together beautifully on TV: Kevin Hart and animals. At the time of writing, the video had 52 million views, 319k shares, 207k likes and 56k comments on Facebook, far surpassing any other recent videos posted on the show’s page. It’s a fantastic 15-minute segment of television. It’s difficult to know whether to listen to the nostalgic Aussie enthusiasm of the late Steve Irwin’s son, laugh as Kevin Hart’s bum becomes sweatier, or watch Jimmy Fallon try and juggle both of them while trying to hold a tarantula. Kevin Hart is quick on his feet and you can see the genuine fear in his eyes as he darts off stage trying to avoid Irwin’s army of conservationist bringing exotic animals onto the stage. First it is a baby ostrich, which Kevin is clearly terrified of, but in context of the others, he probably should have just stroked that one. Next was a snake called LeBron which saw Kevin grinning in panic before he attempted to hold it, before backing out shouting ‘I can’t do it’. Big Red was the name of the Robert Irwin’s third and favourite of his animals. She was a huge tarantula and had Kevin Hart and Jimmy reeling. Jimmy had to hold it because Kevin was having none of it. As the spider crawled onto Jimmy’s hands, Kevin started making loud noises and breathing over them after finding out that breathe is the one thing that could set the spider off. It was at this point that Jimmy started flapping and ended up with his jacket around his head for comfort. I have never laughed so hard throughout this entire episode. 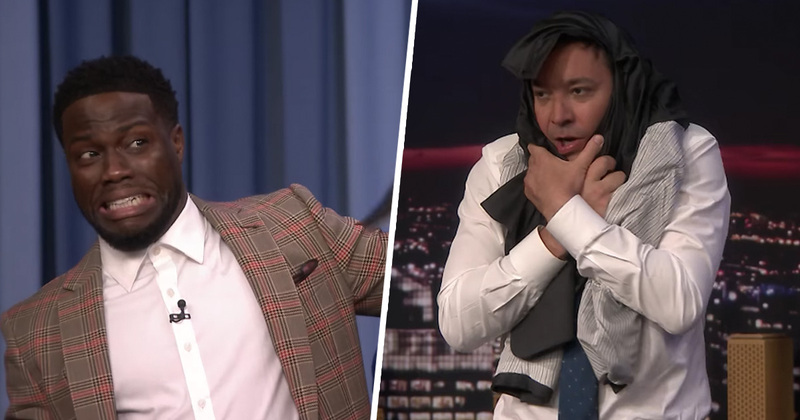 I never miss jimmy Fallon but adding Kevin Hart was a comic match made in heaven. Laughed and laughed. Hilarious and heartwarming. It’s just awe inspiring to see Steve Irwin’s kids carrying on his legacy with such enthusiasm and professionalism, especially for their ages. Kevin/Jimmy added the perfect amount of humour that you would expect for The Tonight Show. Great segment. There were however a large number of comments talking about how they thought Kevin Hart was disrespectful on the show. Robert Irwin received overwhelmingly positive feedback about his enthusiasm and professionalism, while Jimmy and Kevin were criticised for speaking over him. I guess they’re both comedians so love speaking and getting the jokes in. Does anyone else think Kevin Hart was disrespectful and not funny at all? Kevin Hart is actually seriously afraid of certain types of animals. He’s talked about it, The Rock has even talked about it and he’s pulled some small pranks on Kevin & you can see legit fear in his eyes for a couple of seconds when The Rock does it. It’s hilarious but the man really does have a fear of animals. The fact that Kevin even did the last trick surprised the hell out of me. Whatever you think about it, it’s received a ridiculous amount of attention. I’m not Kevin Hart’s number one fan, but I couldn’t stop watching, waiting to see what the next animal would be. Kevin Hart plus animals is just funny. Funnier than just Kevin Hart to be honest.